Forward facing position. For children of 75-105cm tall (approx. 15 months to 4 years old). Rearward facing position. For children of 40-105 cm tall (approx birth to 4 years old). Included is a new-born insert that adapts according to the size of the baby. Easily rotate the seat to face the car door. Makes placing and securing the toddler into the seat easier. Makes entering and switching ride positions incredibly easy. Close-up of the Isofix telescopic anchor. This is the safest installation method, as it prevents any installation errors that could affect safety. Fewer installation risks compared to seats installed with the vehicle seat belt. Front leg close-up, third Isofix system point. Adjustable height from 36 to 55 cm. Highest headrest position up to 105cm. approx. 4 years. The headrest can be adjusted to suit the baby’s height and can also be adjusted while the baby is in the seat. State-of-the-art safety performance, by complying with the latest i-Size (R129) car seat regulation. Full reclining positions in both the rearward and forward facing position with just one hand. Automatic headrest adjustment: adjust the harness height and headrest in a single synchronised one hand adjustment. Front leg, third Isofix system point. Adjustable height from 36 to 55 cm. Includes a removable newborn insert to correct the angle of the baby’s back (for babies 40-80cm tall). New evolutionary cushion insert for use with newborn babies (40 cm.) until the end of its use at approximately 80 cm. 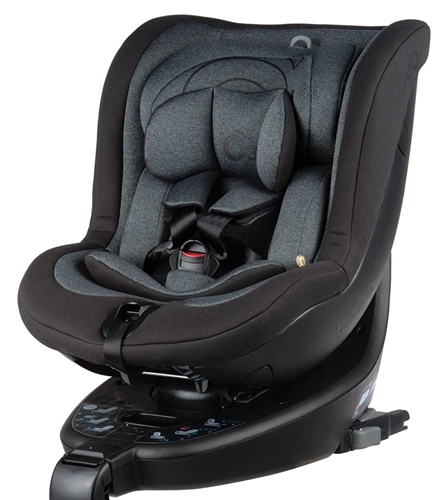 Protective wings and headrest insert for greater side protection when used for newborn babies. The side protectors and headrest insert can be removed as the baby grows and no longer needs them. Highest headrest position up to 105cm. approx. 4 years. The headrest can be adjusted to suit the baby’s height. The i-Size standard has been developed together with car manufacturers to ensure full compatibility between the CRS and the car. An i-Size CRS is 100% compatible with an i-Size vehicle seat and almost all cars with Isofix anchors.